Synthetic Marijuana is a dangerous drug that has recently gained popularity despite its significant number of deadly side effects. The experienced professionals at Serenity Recovery Center have seen the negative impacts of these dangerous drugs, time and again. Synthetic Marijuana, otherwise commonly known as K2, Spice, and Scooby Snax, is a dangerous lab-created drug that has caused a recent surge in overdoses. This drug, which is manufactured to look like Marijuana, is actually sprayed with harmful chemicals that can cause a range of potentially deadly side effects. Despite its toxic nature, the drug continues to rise in popularity among users, especially younger individuals. In an effort to combat this trend, Serenity Recovery Center of Marne, Michigan is raising awareness about the dangers of synthetic Marijuana. In the 1990’s, researchers used synthetic Marijuana to study the effects of THC (the active ingredient in Marijuana) on the brain. Unfortunately, illegal manufacturers took the opportunity to recreate the substance, first selling it legally, under the guise of “potpourri,” in 2004. Word quickly spread about the product’s true intent as a drug, which prompted individuals to use the substance to get high. Unfortunately, synthetic Marijuana has a number of harmful side effects, including hallucinations and psychotic or violent behaviors. According to Serenity Recovery Center, use of synthetic Marijuana has led to an increase in overdoses and deaths in recent years. To avoid further consequences, the recovery center has begun to raise awareness about this deadly drug. Despite the drug being made illegal in the United States, both on state and federal levels, its popularity remains intact. When officials make one strain of synthetic Marijuana illegal, manufacturers (mostly from China) quickly change their chemical compounds, thus creating a new and similar drug, which is not yet illegal under the DEA’s definition. Though the illegality of the drug has deterred storeowners from selling the product, and has also reduced the number of synthetic Marijuana-related emergency room visits, the drug is still widely available on the street. Many of the customers represent vulnerable populations, such as teens or homeless individuals. Its cheap price, misleading packaging, and wide availability make it an attractive option to these groups. According to Serenity Recovery Center, “[i]t is also a popular choice among individuals who are required to take drug tests, as the substance may not show up on a traditional substance screen.” These factors have all led to an increase in overdoses, many of which are deadly. Synthetic Marijuana is often advertised as safe and natural. With the information provided by Serenity Recovery Center, individuals can learn the true nature of the drug and its potentially deadly consequences. When individuals are educated on the dangers of a drug, less people are likely to try that substance or become addicted to its harmful chemical makeup. Readers will also learn the important steps to preventing a surge of synthetic Marijuana use in their communities. With fewer users seeking this deadly drug, illegal manufacturers from overseas will experience less demand, therefore eventually making the drug less available in the United States. This will help save countless lives, especially those in vulnerable populations who are most likely to use or abuse synthetic Marijuana. In 2012 alone, approximately 11% of high school students admitted to trying synthetic Marijuana. In fact, they made up the vast majority of synthetic Marijuana emergency room patients in 2010. With the right education and prevention techniques, fewer individuals from vulnerable populations will become stuck in the cycle of addiction. Importantly, communities will experience less fatal overdoses. As the chemical compounds in synthetic Marijuana continue to evolve, officials must keep pace with manufacturers, while also aiding in abuse prevention efforts. 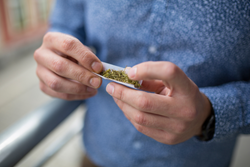 Even one use of synthetic Marijuana can have deadly consequences. For the many communities who are already experiencing high numbers of overdoses, this may come as no surprise. Unfortunately, without the right prevention and education techniques, this deadly trend will continue to grow across the nation. The experienced professionals at Serenity Recovery Center have seen the negative impacts of these dangerous drugs, time and again. By helping to raise awareness about the harmful effects of synthetic Marijuana, they are also helping save lives. For more information, please visit the Serenity Recovery website, or call them at 1-855- 218-3775.